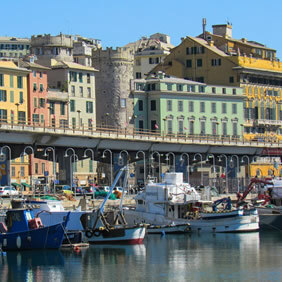 Genoa has the largest medieval centre in Europe, thanks to its success, alongside Venice, Amalfi and Pisa, as a Maritime Republic, during the Middle Ages. One of the largest in Europe, Genoa's historic centre unwinds in an intricate maze of alleyways (caruggi) that open unexpectedly onto small squares; the soul of the city lives here in these alleyways, where smells, tastes, and cultures have combined throughout history. In these narrow spaces, tucked away between the hills and the sea, the pride of wealthy Genoese merchants, indomitable leaders of the Republic, had built beautiful mansions, in which works of art have been collected and preserved for centuries and are visible to this day in several house-museums. Explore this special city with us! • Accommodation and free time for shopping and dinner. Italy's largest sea port is indefatigably contradictory, full at once of grandeur, squalor, sparkling light and deep shade. 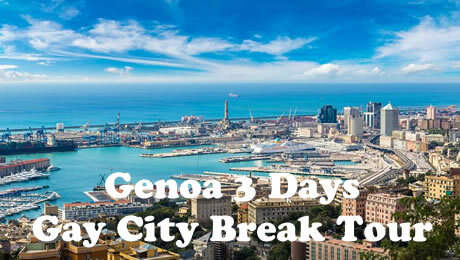 But a gateway to the Riviera for many travellers today, a weighty architectural heritage speaks of its former glory – the Most Serene Republic of Genoa ruled over the Mediterranean waves during the 12th to the 13th centuries – and history feels alive in Genoa. No more is this true than in its extensive old city, an often confronting reminder of pre-modern life with its twisting maze of narrow caruggi (streets), largely intact. Emerge blinking from this thrillingly dank heart to Via Garibaldi and the splendid Enlightenment-era gold-leaf halls of the Unesco-listed Palazzi dei Rolli. The city's once-tatty port area now hosts museums and a number of eating and drinking options. Its old town, too, has had its own far more organic revitalisation, with a bright new crop of fashionable shops, restaurants and bars lighting the way. 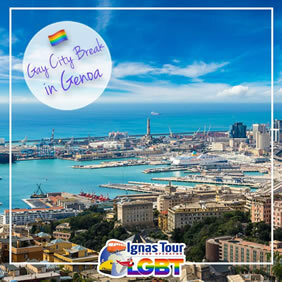 • Together with your LGBT Friendly Guide, you will discover the magic and the secrets of the city! • Morning walking shared tour with LGBT friendly guide. • Among the largest in Europe, the historical city center of Genoa is full of mysteries and curiosities, such as aedicules donated by ancient corporations to improve the lighting at night, and narrow alleys, called "caruggi", revealing some picturesque squares. • It is in this maze of narrow streets that you will get to know the true essence of Genoa: the smells, tastes and different cultures that meet in this coastal town, the pride of wealthy merchants, who decided to build their glorious homes here, now turned into palaces and museums. Houses packed tightly together, a heterogeneous set of architectural styles, churches and historical buildings: this, and much more is Genoa. • The visit starts from the Tourist Information Point, located in the Area of the Old St. Mary Porthouse, and continues through the narrow alleyways to the Cathedral, the Ducal Palace and the Carlo Felice Opera House. • Then you will admire the "Strada Nuova" (Via Garibaldi) and finally you will arrive at the Museums of Strada Nuova. Some of the original furnishings of the house and important masterpieces of Italian and foreign artists such as Veronese, Procaccini, Rubens and Van Dyck are kept here. • At the end of the route the guide will introduce you to the Musei di Strada Nuova. • Free time for lunch on your own tasting local specialities and for shopping, relax or individual visits. • In the evening farewell dinner at a local restaurant. • Afterwards don't lose the opportunity to dance the night away at a Gay Party in one of the most popular gay disco of the city. Rainbow Tips: We can provide you Exclusive Tickets for Gay Discos with special prices! Day 3 - Genoa & Good Bye! • Free time for relax and shopping. • Afterwards transfer by your own from the hotel to the Airport, or Train Station. Rainbow Tips: Want to stay longer? We can provide you Extra Nights and Excursions ! *Subject to availability. The Bristol Palace features an impressive elliptical staircase, leading to its elegant rooms. 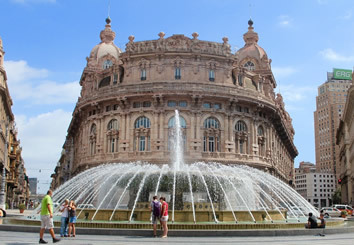 This historic building is in central Genoa, 100 m from Piazza De Ferrari. 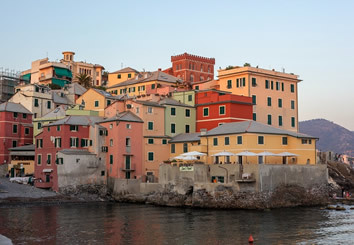 Genoa's Aquarium and harbor area are a 15-minute walk away. The Bristol Palace is an elegant, 4 star hotel in the heart of Genoa, not far from the Ducal Palace, the Carlo Felice Theatre and the most significant museums and historical buildings. It is perfectly positioned for anyone wishing to get to the Old Port where the convention centres, the Genoa Aquarium and the Galata museum. The classic style rooms feature antique furniture, and are soundproofed and air conditioned. Each offers free WiFi and a TV with a selection of free Sky and international channels. The large bathroom is equipped with bath or shower and comes with luxury toiletries. A turndown service is provided daily. The Palace has an elegant restaurant and a coffee shop. Breakfast is a varied American buffet with a selection of gluten-free foods. Hotel Cairoli is located in central Genoa, 100 m from San Siro Cathedral and 300 m from the Genoa Aquarium. It offers a bar and , in summer, guests can enjoy breakfast out on the terrace. Guest rooms come with Wi-Fi access, satellite TV, and a minibar. They all feature a collection of contemporary art. At the Cairoli Hotel you will find a gym with massages and treatments available on request. There are also a TV lounge, a modern conference room free of use and a reading room. Reception is also open 24-hours a day. The hotel is set in a central yet quiet location, close to Genoa Station and the museums in Strada Nuova. * The itinerary is on request and rates are subject to the availability of the hotels at the time of booking. Prices are subject to change if travel occur during trade shows, bank holidays or special events and supplements may be applied. ** Please note that city tourist taxes are not included and have to be paid by the guest directly to the hotel at the time of check in. The amount of the taxes depends on the category of the hotel and length of stay.